There’s one essential thing comedies have to achieve to be even slightly successful: being funny. How ever unfair it may seem, when a film that’s meant to be a comedy isn’t funny it automatically fails at everything else it’s attempting. Going Beserk has a lot of comedy talent in it. It has a plot, a sort of loose comedic take on The Manchurian Candidate, which has the potential to create a great deal of comedy business. Unfortunately Going Beserk is woefully lacking in laughs. Hey, comedy is a subjective business. But there is a real sense of aimlessness in Going Beserk which suggests the director David Steinberg and co-author Dana Olsen were overloading the film with ideas without being particularly concerned with the final outcome. 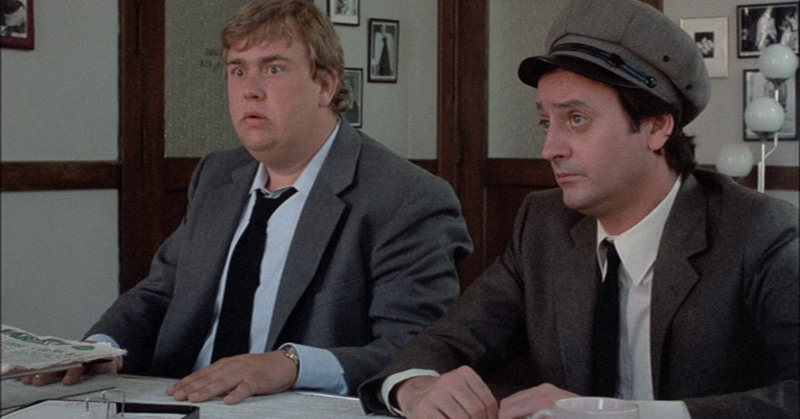 At its very centre is a reliance on the amiable buffoonery of John Candy to carry the audience through the story. The plot involves Candy as John Bourgignon, a chauffeur struggling to make a success of his own company, in the lead up to his unlikely marriage to Nancy played by Alley Mills. Why unlikely? Well Nancy is the daughter of a congressman who is running for president. A religious cult based around aerobics is being prosecuted by the congressman and the story hinges on their attempts at revenge. Also inexplicably thrown into the mix is a disreputable film director (Eugene Levy) who wants to make a documentary about the wedding. Going Beserk is a mess; a film short in length which still manages to meander all over the place despite its relatively straight forward plot. Candy introduces and closes the film in character, a narrator who through the story will apparently become the ruler of a stupid tribe in Africa. This odd fourth wall breaking intro and coda adds a racist overtone to proceedings which is incredibly unfortunate. Again, this part of the plot is an absolutely inexplicable addition to the story. John Candy has an easy charm which is normally perfectly watchable, but when served by material as weak as this it hardly seems worth bothering. Going Beserk is out on DVD on Monday 6th June. We’d give it a miss.